Robert Downey Jr, draped in an egotistical, incisor flashing smile, surfs his fingers over the visage of an Audi that has the color of a blue jay’s plumage. The master thespian lowers his sunglasses, tilts his head down like a craning viper, and emits a cool sentence with the gratifying reverberation of a horseshoe straddling a metal stake. “Wow, Robert Downey, Jr is amazing,” I think, while watching Iron Man 3 flush across the width of my iris. That is probably what director Shane Black wants me to write. But that’s not quite what I believe. The slick, garrulous, cuff-tugging impresario Tony Stark is a personality everyone paws at in the Marvel Universe. Adorned with a manicured beard straight off of former Red Sox baseball player Mike Lowell, Stark is all sheen – from suit to soul. Robert Downey Jr plays the brilliant scientist and superhero with a cloying hyuk in his tongue and a barrage of pyrotechnics in his step. Three movies into the Iron Man franchise and one appearance in The Avengers later and RDJ is still puffing out his chest, flipping superfluous one liners, and masticating hearts with his bubbly persona. Now as sardonic, gear-whizzing, and cool as that may be, there has, by and large, always been a problem with Tony Stark – and that’s because he’s a womanizing, salacious, incongruous mass of hormones and clunky quips. Basically he’s a 17-year-old with unparallelled science chops in a 35-year-old man’s body. There’s nothing to root for in someone that jostles their sunglasses while having a narcissistic smirk painted across their mouth. Why should someone care about a character that has the mental makeup of an Elimidate or MTV Real World contestant? The series has ultimately sent me to a exile in my own self-imposed Elba, due to the incessant bravado and corny banality that is so bad it would have been left on the cutting room floor of a Two and a Half Men episode. Churning metal and gun-toting baddies being harpooned by thrown cars is fine – sometimes. But it’s basically boring after a few rounds of the same body blows. 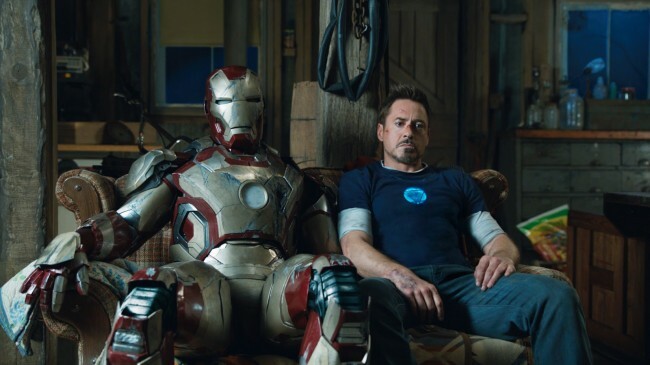 In Iron Man 3, there are obligatory scenes of action; buildings rattle and sarcastic exchanges are the watermark of the series. In this episode, Tony Stark is humanized; he grapples with a tenderized psyche and an eroding sense of self. He dons several suits – and disposes of them just as quickly – proving to be a sort of metaphorical shedding of skin. Stark isn‘t the hero here; he‘s too busy combing over his soul to find meaning. Director Shane Black wields a salty pen in the third installment of the series. The vehement, temperamental, syrupy attitude of our hero and philanthropist feels raw – these screenwriters finally sawed the muzzle off. The zingers are self-deprecating and the wonky, charismatic gravitas of RDJ is lampooned – finally something that feels tactile, sincere. The action is also tremendously shot. Glass shatters with purpose and walls are torn apart with reason. The CGI is still gratuitous, there is no doubt, but there seems to be a sculptor behind the images this time around. And that’s not an easy thing to do with a malleable, disaster-enabled computer environment – but somebody managed to use some restraint. The dialogue in the series, ever so knotted up by bad sitcom jokes, this time feels self-aware. Shane Black and Drew Pearce really pounded the resin bag when writing these exchanges. The writers’ pandering to comic-book levity is still here, but their work still manages to feel crosshatched with a sort of palpable sharpness. The plot doesn’t really matter, ultimately, although some comic-book purists kicked rocks after the screening (the Mandarin has been changed in a few disconcerting ways that don’t quite align with his comic-book persona , I hear, although Ben Kingsley’s loose embodiment is great, right down to his pulpy voice and imposing glare). All of the cast does heavy lifting, to be honest, and even Gwyneth Paltrow gets a few dedicated pages to her character’s grittiness and ingenuity. A lot of the subplots are marred with generic superhero pap – and some of the movie is a parody of itself – but everything ends up working. It’s not didactic or exploratory, but instead it’s a perfect kind of vapid with a touch of snark – and thankfully there is some humility despite the storm of CGI explosions. Author’s note: Guy Pearce is fine. Don Cheadle is no Terrence Howard. Rebecca Hall phones it in and rings up a huge bill.